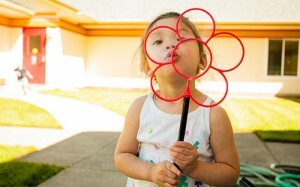 Our preschool summer program serves children of all abilities. Emphasis is on play-based, active learning in a beautiful park setting. Wednesdays are Water Play days! Snacks are provided, lunch must be provided by parents. You must pay the registration fee in order to hold your child’s spot. Email donna_brown@oldmillcenter.org or call 541-757-8068. Donations allow Old Mill Center to provide services that are not otherwise funded. To make a tax deductible donation see our Donate page. A variety of volunteer opportunities are available through fundraising events, in the classroom, for childcare and in the administration. To volunteer, see our Volunteer page or call 541-757-8068.